Across the Kashmir Valley and over the famous Zoji La pass lies Ladakh - the Land of High Passes. This region once formed part of the erstwhile Kingdom of Ladakh. 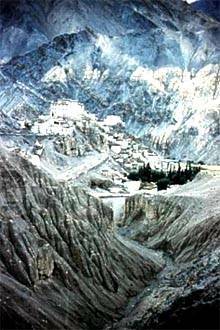 In fact, it is believed to have been the first region to be inhabited by the early colonizers of Ladakh - the Indo-Aryan Mons from across the Himalayan range, the Darads from the extreme western Himalayas, and the itinerant nomads from the Tibetan highlands. Also, its valleys, by virtue of their contiguity with Kashmir, Kishtwar and Kulu, served as the initial receptacles of successive ethnic and cultural waves emanating from across the Great Himalayan range. The 434 km Srinagar-Leh highway follows the historic trade route, thus giving travellers a glimpse of villages that are historically and culturally important. Thus, while the Mons are believed to have carried north-Indian Buddhism to these highland valleys, the Darads and Baltis of the lower Indus Valley are credited with the introduction of farming and the Tibetans with the tradition of herding. The settlements that evolved as a result of intermixing of these elements-ethnic, occupational and cultural-now serve at home to a syncretic micro-society of J&K state. The aridity of Ladakh is due to its location in the rain shadow area of the Great Himalayas, as well as because of its elevation and the radiation of heat from the bare soil. The most striking physical feature of Ladakh, however, is the parallelism of its mountain ranges. In Ladakh, large rivers and their tributaries have carved deep gorges far below their steep banks. However, their water is not of much use, as the terraced fields lie high above the gorges. The region is extremely dry, with rainfall as low as 10 cm each year. The Suru valley receives comparatively higher degree of humidity in the form of heavy winter snowfall due to the cohesion of the snow-covered wall of the Greater Himalayas, and vegetation here is more luxuriant than in Eastern Ladakh. The upper Suru Valley, in particular, has extensive alpine pastures, which attract large flocks of the Bakarwal herdsmen from the Jammu hills every summer. This region once formed part of the erstwhile Kingdom of Ladakh, believed to have been inhabited by the early colonizers of Ladakh - the Indo-Aryan Mons from across the Himalayan range. These valleys sustain an exclusively agrarian population of about 80,000 people who cultivate the land available along the course of the drainage system, wherever sources for artificial irrigation are available. The majority of the population is Muslim. Descendants of missionaries of Kashmir who introduced Islam, locally called Aghas, still hold sway over the population, perpetuating the faith even as ancient folk traditions with Buddhist and animistic undertones are palpably present. Many folk traditions, particularly those connected with the agricultural cycle, are still followed with subdued reverence. In such an inhospitable climate and desert land, a village must centre around a stream. The streams here come from the glaciers of the higher reaches and form parts of rivers most of which eventually flow into the Indus. Wherever a stream roams through a broadening valley, it is possible to lay a series of terraced fields, which can be irrigated in turn by directing the water supply into small artificial water courses. Crowning the chief hill of the village and dominating its life, as its position would suggest, is the monastery. The road both enters and leaves the village through a "chorten" gate. Apricot trees against a background of azure sky and glittering peaks surround these fascinating villages. The houses are clustered above the area of cultivated terraces at the foothills. Approached by stony paths or tracks, the houses are so built into the hillside that convenient pieces of rocks often serve as walls or floors. Often rock overhangs are used as roofs and a sunny platform will be enclosed with rough walls to stable animals by day in winter. In the bigger houses, one room is dedicated as a little private chapel, used mainly by the master of the house for reading his holy books and saying his prayers. Where a whole room cannot be set aside, a small corner in the best room will be arranged as an altar. The river Shigar flowing from the north, drains an adjoining part of the Dras Valley. In summer, as the snow in the uplands melts, the volume of this river rises considerably. It meets the Suru River near Kharul a short distance away from Kargil. The terrain is characterised by rock and stone with the occasional greenish patch formed by willow and groves. The inhabitants of Dras valley, the Brokpas, migrated to this tract from Gilgit several centuries ago. During the last decade a gradual change in the tourist's perception of Ladakh has come about, thanks to the growing mystique of the Himalayas and a burgeoning interest in adventure tourism worldwide. As a result of this change in perception there has been a steady increase in the number of tourists to the Western flank of Ladakh, which comprises several river valleys. Chief among these are the spectacular valleys of Suru and Zanskar, nestling along the foothills of the main range of the Greater Himalayas; the smaller lateral valleys of Dras and Wakha-Mulbek, as also of Chiktan (still in the restricted zone) constitute important subsidaries. 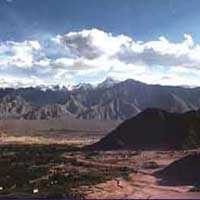 Drained and formed by the southeastern tributaries of the high Indus, these valleys constitute the district of Kargil. The itinerary of the average tourist to Ladakh begins with a tour of Leh, the ancient capital and principal township of Ladakh. It invariably includes visits to a selection of monasteries located along a stretch of the Central Indus Valley, between the spectacular monastery of Lamayuru in the west and the prestigious establishment of Hemis in the east. Some take to trekking along the lateral valleys, especially in Markha, but few venture out of the confines of the central Indus valley, which represents Ladakh's heartland. 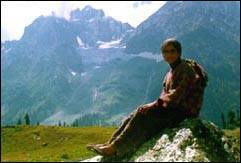 Several outfits in India and abroad organize long treks and tours in the region. There are a select few companies specializing in organizing mountaineering expeditions to the Nun-Kun region and the Zanskar Mountains.